The Real range from Elite opens up the virtual worlds of real life courses, and direct connection with a PC or laptop allows you to ride these courses and experience the terrain as if you were actually out there on your bike. The resistance of the RealPower turbo trainer is automatically synced to the video courses you are riding on, which means that when you go up an incline you really feel it in your legs and you have to push yourself to make it up them. The RealPower is a top-end turbo trainer and can simulate impressive slopes of up to 20%. Also, as your speeds increase you move through the videos in real time, so the fitter you get the faster you will compete the courses. How close can you get to Wiggins, Cavendish or Froome. The turbo trainer uses an electro-magnetic resistance brake, but unlike regular magnetic brakes the Elite RealPower uses an innovative magnetic powder rather than a solid state magnet (or series of magnets). The special magnetic powder can vary its viscosity depending on the electrical current passing through it, which in turn provides altered resistance to the rotating blades that are powered by you as you pedal. The magnetic brake can generate high power outputs even at low speeds (500 Watts at 15km/h), while the RealPower’s oversized flywheel provides extremely smooth pedalling motions (they estimate that their oversized flywheels have a 250% greater moment of inertia than other rollers with large flywheels). The resistance unit uses a special Elastogel roller that reduces noise by 50% and rear wheel tyre wear by 20%. This Elastogel material is exclusive to Elite and is a techno-polymer. With the software behind the trainer you can not only race on extreme circuits such as those found on the Tour de France or the Giro d’Italia, but you can also import your own GPS data, chart your training, and race against others. The Real software displays and analyses many training functions, as well as providing several RealVideo courses, training programs, tests (including a Conconi test for anaerobic threshold analysis), web races, and linkups with Google Maps. All data is passed wirelessly from your computer to the turbo trainer using ANT technology, which is used to control and monitor resistance. 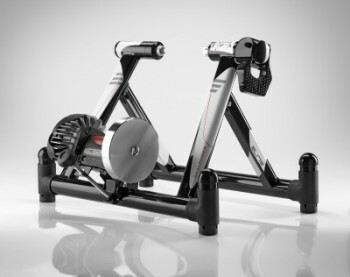 While this is an expensive turbo trainer, the Elite RealPower really does come with a lot of features that will enhance you workout and add extra realism. The sturdy trainer frame comes with Ritmo feet, which use a spring-adjustment support system that allows the frame to tilt and rotate with the rider, meaning when you really push and get out of the saddle up those steep French mountain roads the bike will move about just like you’d expect it to. However, if you do not want this added realism for whatever reason, Elite also supply standard trainer feet for a more stable ride. 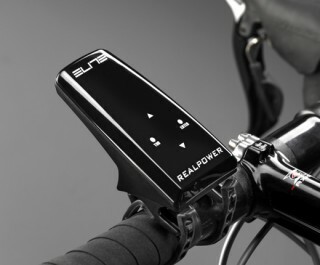 The Elite RealPower comes with a handlebar mountable computer console so that you can manually control the software on your PC or laptop without getting off your bike. A USB dongle that fits into your PC or laptop allows communication with this bike computer. 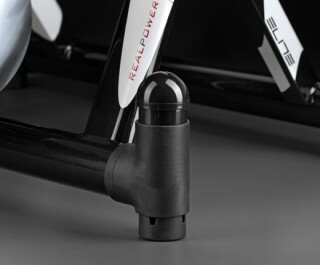 The Real Power also uses sensorless cadence technology and comes with a Gel Block front wheel riser, which places your bike into a more realistic riding position and counteracts the raised back wheel position. The Gel block also reduces front wheel vibrations and offers increased stability. You can get more details about the RealPower trainer and the Real software on Elite's website here.